SANTA CLARA, CA--(Marketwire - January 25, 2011) - Last summer, NVIDIA astounded gamers with the introduction of the GeForce® GTX 460 GPU, which editors called "an incredible value"(i). Flash forward 5 months later, and NVIDIA is set to do it again with the immediate availability of the new GeForce GTX 560 Ti GPU. With average performance that is 33% faster(ii), overclocking headroom that is off the charts, and a performance per watt that puts competitive products to shame, the GeForce GTX 560 Ti is further proof as to why GeForce GTX GPUs are favored by PC gamers worldwide. With full support for NVIDIA 3D Vision™ and NVIDIA Surround™ technologies, the GeForce GTX 560 Ti GPU also provides the graphics horsepower and video bandwidth needed to experience more than 500 games and high-definition Blu-ray movies in eye-popping stereoscopic 3D on a single display or spanning across three screens for an immersive gaming environment. And with NVIDIA SLI™ technology, the industry's most scalable multi-GPU platform, gamers will be delighted by the sheer increase in gaming performance by adding a second GeForce GTX 560 Ti to their PC. For more information about the GTX 560 Ti, please visit www.geforce.com. NVIDIA (NASDAQ: NVDA) awakened the world to the power of computer graphics when it invented the GPU in 1999. Since then, it has consistently set new standards in visual computing with breathtaking, interactive graphics available on devices ranging from tablets and portable media players to notebooks and workstations. NVIDIA's expertise in programmable GPUs has led to breakthroughs in parallel processing which make supercomputing inexpensive and widely accessible. The Company holds more than 1,700 patents worldwide, including ones covering designs and insights that are essential to modern computing. For more information, see www.nvidia.com. 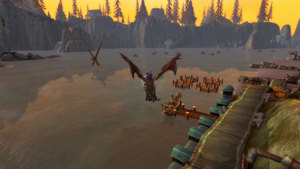 Certain statements in this press release including, but not limited to, statements as to: the benefits, features, impact and capabilities of the GeForce GTX 500 series of GPUs are forward-looking statements that are subject to risks and uncertainties that could cause results to be materially different than expectations. Important factors that could cause actual results to differ materially include: our reliance on third parties to manufacture, assemble, package and test our products; global economic conditions; development of more efficient or faster technology; design, manufacturing or software defects; the impact of technological development and competition; changes in consumer preferences and demands; customer adoption of different standards or our competitor's products; changes in industry standards and interfaces; unexpected loss of performance of our products or technologies when integrated into systems as well as other factors detailed from time to time in the reports NVIDIA files with the Securities and Exchange Commission, or SEC, including its Form 10-Q for the fiscal period ended August 1, 2010. Copies of reports filed with the SEC are posted on NVIDIA's website and are available from NVIDIA without charge. These forward-looking statements are not guarantees of future performance and speak only as of the date hereof, and, except as required by law, NVIDIA disclaims any obligation to update these forward-looking statements to reflect future events or circumstances. © 2011 NVIDIA Corporation. All rights reserved. NVIDIA, the NVIDIA logo, 3D Vision, Fermi, GeForce, NVIDIA Surround, SLI, and CUDA are trademarks and/or registered trademarks of NVIDIA Corporation in the U.S. and other countries. Other company and product names may be trademarks of the respective companies with which they are associated. Features, pricing, availability, and specifications are subject to change without notice. For those gamers who haven't upgraded their GPU in a while, you are missing out on some awesome visuals in your favorite game! 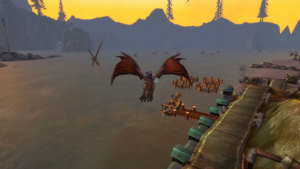 Take a look at this screen shot from World of Warcraft running on a GeForce 8800 GT. Looks pretty good, right? Now, take a look at the same screen shot, only this time running on a GeForce GTX 560 Ti. Although the 8800 GT was a great card 3 years ago, the GTX 560 Ti ushers in a whole new dimension in gaming, with ultra realistic shadows, reflections, and scene detail, including the houses on the top of the cliff, that weren't visible before. It's almost as if you are playing a whole different game! 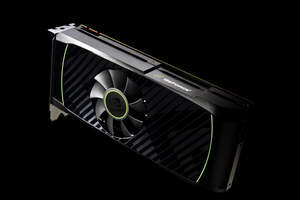 With 8 tessellation engines delivering a stunning amount of performance for today's newest DX11 games, the GTX 560 Ti brings a new level of performance to PC gaming platforms, and well as super quiet acoustics and support for 3D Vision, PhysX, and SLI technologies, advanced features provided only by NVIDIA GeForce GTX GPUs.